Some years ago I was sat watching a film, Weekend at Bernie's 2, it's one of those silly early 90's films that are stupidly unrealistic and silly but you find yourself watching and giggling at anyway. A large part of the film is based in St Thomas, US Virgin islands and since then I decided I had to definitely visit one day so when trying to decide between the Eastern and Western Caribbean itinerary for our cruise, spotting that the Eastern stopped there was a big pull towards that one. And boy it did not disappoint after years of dreaming, waking up at the half way point of our cruise and our 2nd port day and walking onto our verandah to be met by the beautiful view of St Thomas was an absolute dream start to such a fun, wonderful day. We had around 6 hours to 'play' today and unlike in Tortola we had an excursion booked, so after enjoying a tasty breakfast, like we had every day previously, honestly the food is one of the highlights on a cruise for me, oops nearly got side tracked with food there, yeah that pretty much tells you a lot about me ;) ...now, where was I, we had breakfast and then made our way off the ship and as we were a little early for our pick up we managed to make use of the free wifi at the port, I'd been without contact to the world for 3 days now, no internet or phone service and as nice as it was, I admit I was missing seeing what was going on with everyone on Twitter, posting on Instagram etc and then the brilliant Sunny from Sunny Liston tours arrived and our tour began. 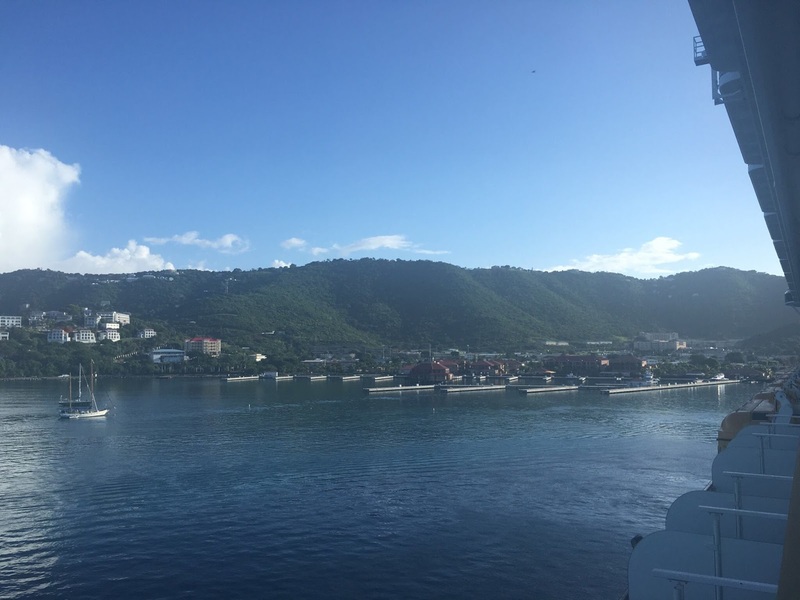 We made a short drive to Main St in Charlotte Amalie where we spent about 45 minutes having a look around the water front, shops and the general area and then the fun really started. We made our way up the mountain stopping at a number of spots along the way to enjoy the absolute stunning views before reaching the highest point in St Thomas, Mountain Top, my ears weren't keen on any of this but my eyes, well my eyes were in love. St Thomas is truly beautiful, so much greenery and the views across to the other islands are breath taking and being up the top of that mountain was a moment I'll remember forever, I felt in my own little peaceful place where all I could think about was how grateful I was to be able to experience moments like that and have these wonderful memories forever planted in my head, life can be hard at times but it can also be a truly wonderful thing that we should cherish and enjoy as much as possible. From the top of the mountain we could see the most stunning little beach I'd ever seen, Magen's Bay beach and that's where our next stop was for a dreamy couple of hours to enjoy the beach and swim in the turquoise sea. I could have stayed on that back all day long, when I think of Caribbean beaches, that is exactly what I picture. Sadly after soaking up some St Thomas sunshine, swimming in it's beautiful, bath warmth water, our few hours at this little piece of beauty were over and it was time to make our way back to The Fantasy. If you're planning on visiting St Thomas I cannot recommend Sunny Listion tours enough, we really did have such a fun tour and Sunny himself was absolutely fantastic, full of great information about St Thomas itself and surrounding islands but most importantly he was great fun and made the tour a laugh from beginning to end. with everyone singing a dancing in the seats while driving around this absolute beauty of a place.